Tag line: "A Death Fight . . . Between Two Beasts !" A direct sequel to The Wolf Man, 1943’s Frankenstein Meets the Wolf Man also served as the 5th installment in Universal’s Frankenstein series. After watching it, however, I can’t help but wonder why the studio even bothered pairing these two classic creatures. Despite being mentioned in the title, Frankenstein’s monster (played by Bela Lugosi) is essentially reduced to the role of a secondary character. Frankenstein Meets the Wolf Man opens in a cemetery in Wales, where two grave robbers are breaking into the crypt that houses the remains of Larry Talbot (Lon Chaney Jr.), better known as The Wolf Man. When Talbot’s body is exposed to the light of a full moon, he returns to life, forced to once again endure the curse of being a werewolf. Hoping to die (and this time stay dead), Talbot visits the gypsy woman, Maleva (Maria Ouspenskaya), for advice, and, at Maleva’s prompting, she and Talbot set out for the castle of Baron Frankenstein, the one man who wields power over life and death. But upon their arrival, Talbot and Maleva learn the Baron is dead, and only his daughter, Elsa (Ilona Massey), remains. To further complicate things, Talbot, after yet another transformation, inadvertently reawakens Frankenstein’s monster (Lugosi), which was trapped in the ice underneath the castle. Yet all is not lost, because Dr. Mannering (Patric Knowles), who had been tracking Talbot ever since he left Wales, believes he can interpret the late Baron’s notebooks, and perhaps find a way, with the help of the monster, to end Talbot’s misery once and for all. Frankenstein Meets the Wolf Man can be broken into two parts. The first half, where we follow a freshly resurrected Talbot as he searches for a way to die, is excellent, boasting plenty of atmosphere (especially the opening scene in the graveyard, a tense sequence that starts the film off on the right foot). I also enjoyed seeing Ouspenskaya back as Maleva, who has a slightly bigger role this time around. Unfortunately, the movie falls apart when the action shifts to Frankenstein’s castle, and the reason why is Bela Lugosi. As the creature, Lugosi does nothing more than stumble about with his arms outstretched, reducing the monster to a caricature of its former self (though, in Lugosi’s defense, it’s rumored he was instructed to play the part as if the character were blind, a plot point that was allegedly scrapped in post-production). Thankfully, the monster was given a minimal amount of screen time; so little, in fact, that his presence felt unnecessary. 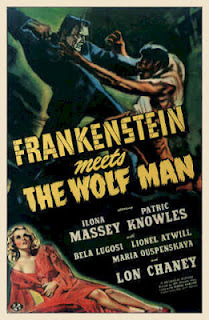 As if on cue, the remainder of Frankenstein Meets the Wolf Man becomes a trite, somewhat predictable affair once Lugosi makes his grand entrance, and the last half of the movie is a far cry from the promise on display at the beginning. Quite correct, thank you. At the end of "Ghost of Frankenstein," bad Doctor Bomar puts the brain of Igor (played by Bela Lugosi) into the skull of the Frankenstein Monster. As a result, the Monster cat now think and speak in Lugosi's voice, but his blood is of the wrong type and the Lugosi/Monster goes completely blind. When revived for "Frankenstein meets the Wolfman," the Monster not only stumbled around, blindly groping like a drunken man, but also spoke with Lugosi's sick Hungarian accent. At the last moment, the Studio heads at Universal decided against the Frankenstein Monster having the power of speech ( despite the fact that he clearly spoke in "Bride of Frankenstein" and the end of "Ghost of Frankenstein." The film was not reshot, but all of Lugosi's lines were erased, and the film was recut to minimize the Monster's mouth movements without much success. This added yet another bizarre bit of characterization to Lugosi's seemingly inexplicable performance. The Frankenstein monster's blindness is never explained, nor is his muteness. The last minute cutting of Lugosi's dialogue also cut several important plot points, rendering the second half of the film confusing at best. None of this was Lugosi's fault, but rather that of the studio brass. At present, there is no surviving footage of the go sees the ghost he's Lugosi is Bella at present, unfortunately, there is no surviving footage of Lugosi's Monster speaking.